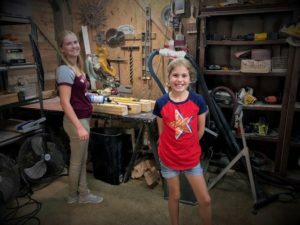 You are here: Home » FARM TABLE DISTRESSING PARTY! 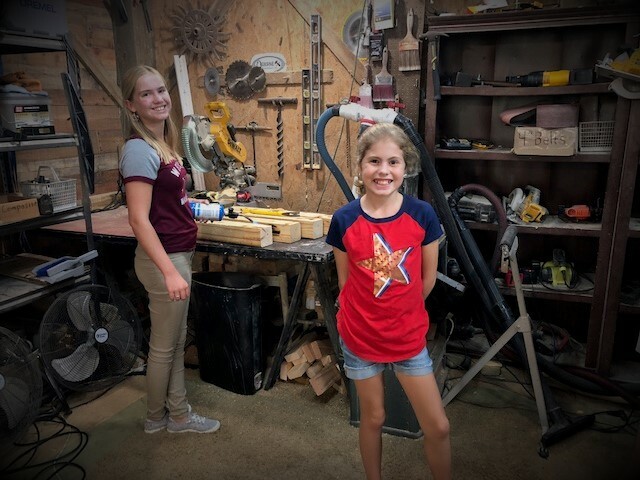 Tearing your table down, so it can be reborn..
Our friends Carly and her mom Jamie got to be part of the farm table building process! A rare fun occasion where you can bang up your own table to distress it before it’s finished. 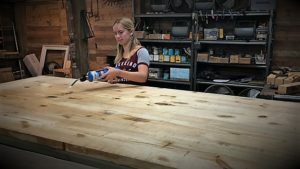 Carly is 13 and loves art and loves to build and insisted on being part of the distressing process during the building of their family dining table. Jesus Tables showed them both some of the tools, options and techniques which go into the farm table distressing process. Some of the items they used to give the table a more aged/weathered look were tools such as chains, hammers, hand saw, nails, large screw heads, hand planer, ice pic, torch, razor blade, wire wheel and the worst of the worst is the Jesus Table flogger tool. That thing puts on some serious wear and tear at random. 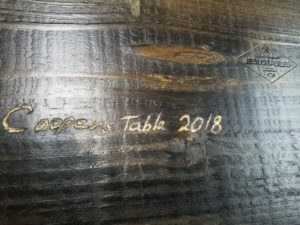 After the table had been beaten up by hand for a while, it was time then to sand the entire table down to make the distressing marks look like they are older and that they had been there for a very long time. The palm sander is where the art part of the table comes into play. After sanding came the natural onyx stain, then stain was sanded to weather it down more and then coats of varnish sealed up all the wounds and after a gruesome death it was reborn to look better than ever. 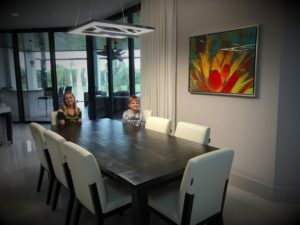 It really turned out nice sitting at 8 feet long it fit their contemporary black and white home. 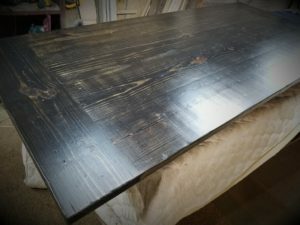 The distressed table added character to the home where it didn’t yet have any. 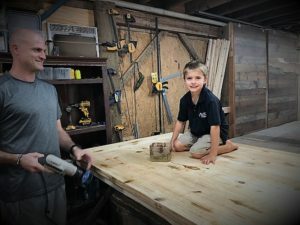 The distressed Jesus Table is the last table they would ever buy and they really enjoyed having fun distressing their own table. It’s something they can tell the next generation of family members about.